Our Philly Gourmet Burgers review is specifically written about the 100% beef patties. 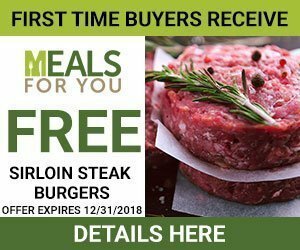 When found on sale these are a very affordable frozen burger option, but are they worth it? We prefer fresh ground beef for our burgers but we also know sometimes that is not an option. So on occasion frozen beef patties are easier so we typically have a box in our freezer at any given time. 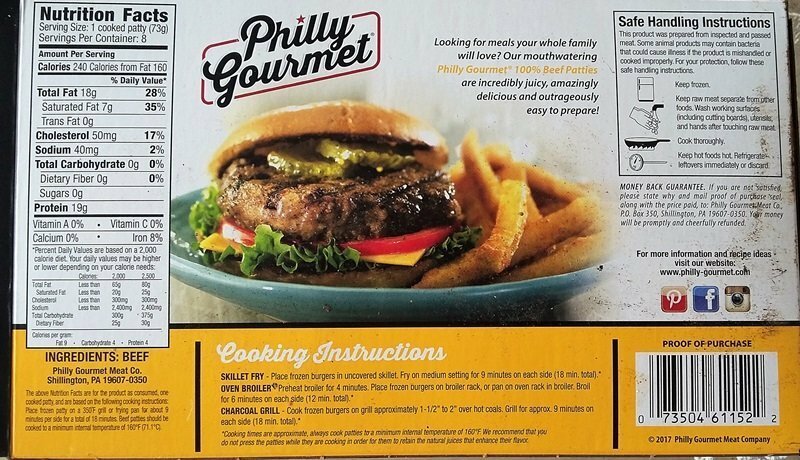 The package is typical of most frozen hamburger patties with a picture that is nothing like the actual product. Unless you pack 3 patties together your burger will not look like the image on the box. The ingredient listed are just Beef, this is good. Do not follow the grilling instructions on the package, unless you want hockey pucks. 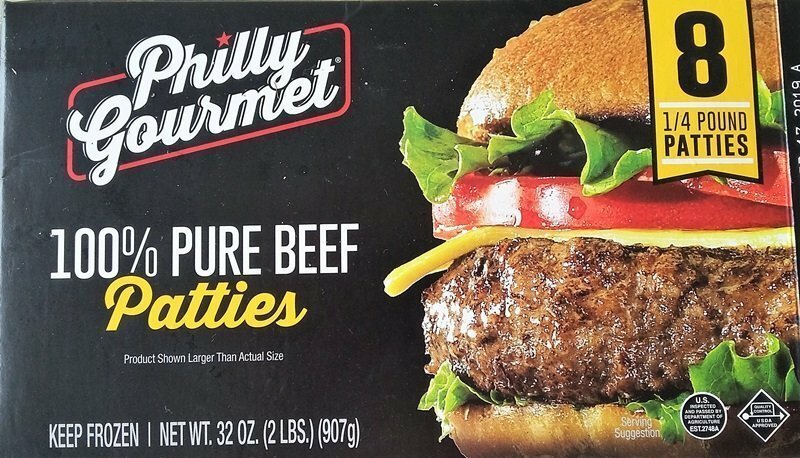 The Philly Gourmet Burgers are your prototypical frozen burger patties. 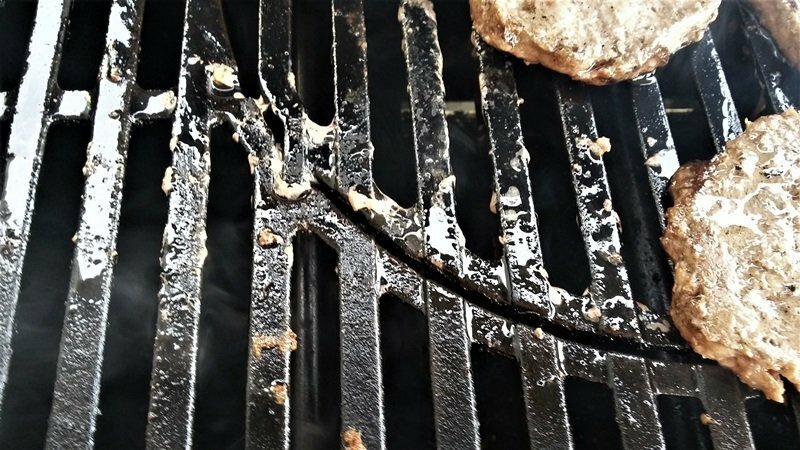 This means that they will unload a lot of grease on your grill and shrink up considerably when cooked. As long as you are aware of this and pull them off the grill at the right time they will turn out fine. Philly Gourmet Burgers Review: the Grilling. Heat your grill up to a medium-high to high heat. Total grill time will be 16 to 20 minutes. 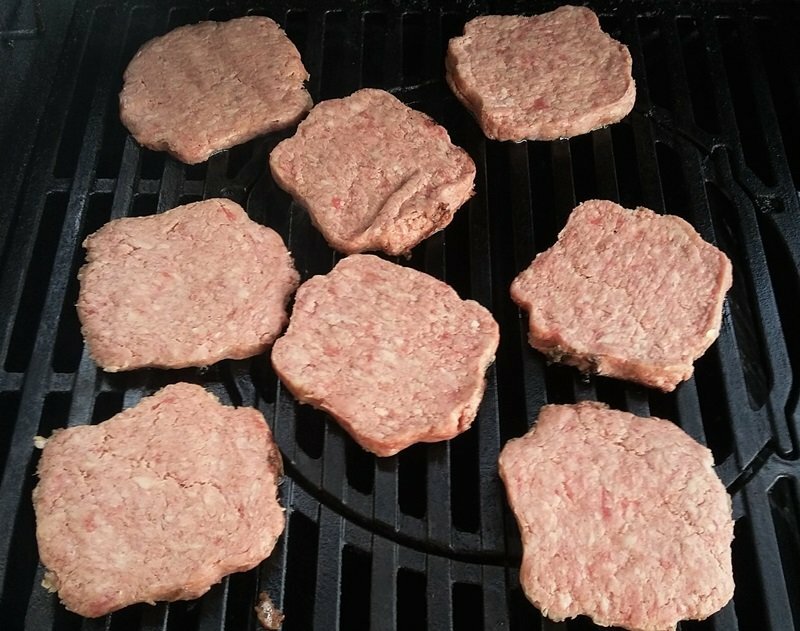 While its warming up you will need to pry those frozen burgers apart. These have wax paper squares between each patty so they come apart fairly easy with your spatula. 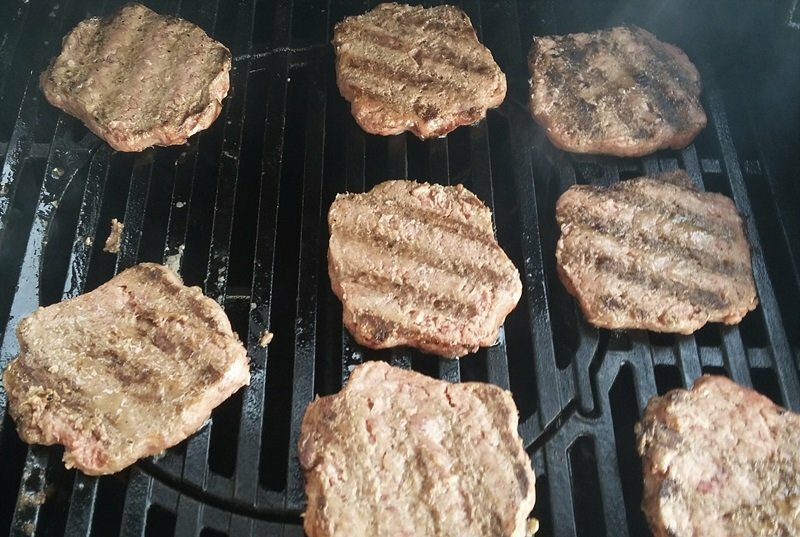 Before placing the frozen burgers on your grill turn the heat all the way down. We want as much radiant heat as we can get with very little flame, to prevent flare-ups. Place the patties on the grill for 4 to 5 minutes, this will begin the thawing process. Now that the outside has softened add your seasonings. We used McCormick Hamburger seasoning, feel free to use whatever kind of seasoning you would like. I also like to lightly press the seasoning into the meat so it doesn’t all fall off when turned. Turn the patties and repeat the seasoning process. Grill for another 4 to 5 minutes and flip again. 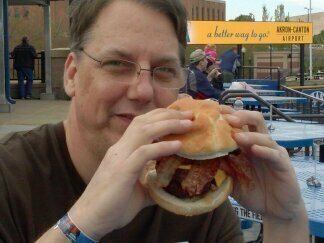 At this point the grease should begin to release from the burgers and you should see some shrinkage. If not you may want to turn the heat up a little. From here on out grill with your lid open so that you can be on the lookout for flare-ups. The grease these loose is considerable. Let them cook for an additional 4 to 5 minutes and flip one last time. If the patties are not shrinking up evenly move them around. They should loose 25 to 30% of there size. 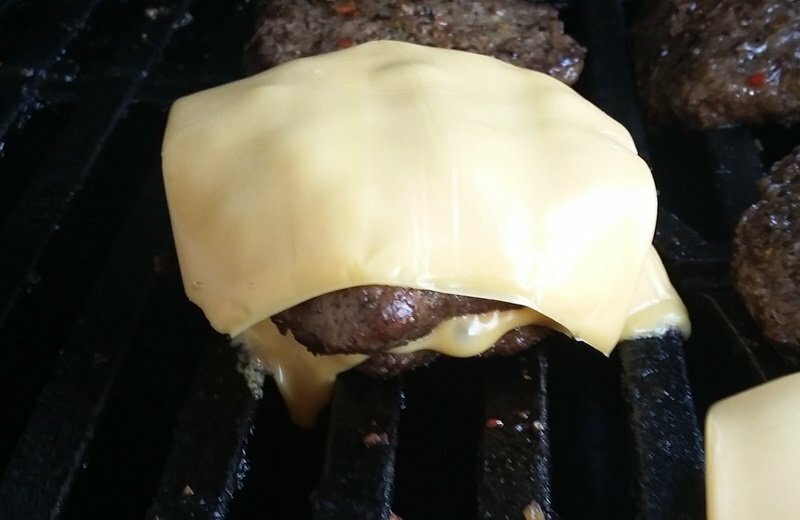 If at any time the patties start to curl (not lay flat) pull them immediately. This is a sign that they have dried out. If you want to add cheese now is the time. Philly Gourmet Burgers Review: The conclusion The most important part of a review is the flavor and I will have to say that when grilled properly the Philly Gourmet Burgers aren’t bad at all. While they are certainly better than fast food burgers, I wouldn’t go as far as to call them gourmet. The price makes them a worth while purchase especially when grilling for a large group. 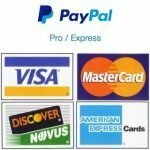 I purchased the Philly Gourmet 100% burgers 8 Ct. They were tasteless. I put salt,pepper, added onions , my husband said don’t ever buy these again. They were horrible . I felt I through my money away. Thanks for the comment. When we purchased ours they were on sale and the cheapest frozen burgers the store had so I don’t agree about the throwing money away part. My expectations of any product are in-line with what they cost. We just had these last night. Neither of us even finished our burger. They were tough and rubbery. Did not have the flavor or consistence of beef. We threw the rest of our burger and the remainder in the box away. Sean, thanks for the comment. We are happy to provide an open forum for people to complain, but a couple of things you have wrong. We did purchase, cook and eat the Philly burgers before writing the review. These were the cheapest frozen burger available at the time we purchased them. All our pictures are of the actual product and yes they do look like Bubba burgers.